There is nothing more intimate than being up close and personal with some of the most impressive creatures on the planet, the rare endangered Mountain Gorillas in Rwanda and Uganda. There are two trips running, one will be a 6 day trip with 2 permit days and an optional 3rd in Rwanda. The other will be a 6 day trip with 2 days in Uganda trekking with the mountain gorillas and and an optional 3rd day with the Gorilla sin Uganda. If this is on your bucket list, now is the time to go. there are less than 800 Gorilla’s left in the Mountains. Includes: accommodation & meals as stated (B-Breakfast, L-Lunch, D-Dinner), airport meet/greet & airport transfers as per itinerary, private professional English speaking driver/guide & private 4×4 vehicle throughout, transfers to all visited areas as per itinerary, park entrance fees as per itinerary, four Gorilla Permits per person. Upon your arrival into Kigali International Airport (KGL), you are met by your private professional English speaking driver/guide and private 4×4 safari vehicle and head up to the Volcanoes National Park. Note that arrival should be before 1pm, for those arriving on later flights, please book a night in Kigali beforehand. A ‘true island in the sky’, the Volcanoes National Park is home to some of the worlds few remaining Mountain Gorilla, which were first studied here in 1959 by George Schaller, and through the 1960’s by Dian Fossey and her colleagues. In the afternoon you’ll have a briefing where Scott will take you through the next few days and ensure you are properly prepared for your encounters with the gorillas! Overnight accommodation: Five Volcanoes Boutique Hotel – You will find a warm welcome at Five Volcanoes, which is ideally situated close to the park headquarters for the start of the gorilla treks. The hotel comprises of 13 double/twin en-suite rooms and a two bedroom VIP cottage. After a day of trekking what better way to relax than in the sparkling swimming pool followed by a visit to the sauna and/or steam room. The hotel also has on site massage rooms to help you unwind even further. 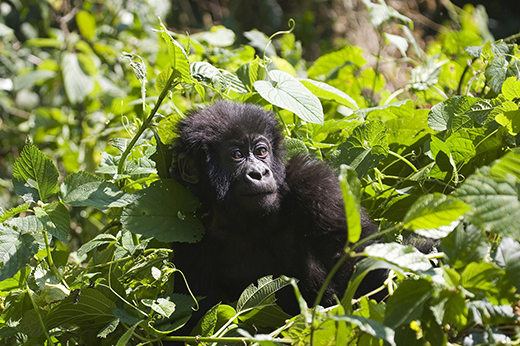 Enjoy 2 days of gorilla tracking. The gorillas we are allowed to track belong to either one of ten habituated family groups. An early breakfast and you’re off to the park headquarters at Kinigi to register and be allocated your gorilla family for today. Once this is done, you set out by vehicle to the start of on your gorilla safari. The gorillas are by no means tame, and are completely wild animals. However, experienced guides will accompany you on your gorilla tracking, many of whom have been involved in the habituation process themselves. The guides will use their knowledge of the gorillas’ habits and information from the previous day to locate the group’s whereabouts. Scott will guide you through how to get the best out of your photographs and in the evenings, go through them with you so you can improve your skills in following days. Today you have a chance to either track the gorillas another time, head out in search of the golden monkeys or visit the remains of the Karisoke Research Centre where Dian Fossey worked, which includes a chance to visit the meadow of where her mountain hut used to be, with views of Bisoke, Karisimbi and Sabyinyo peaks. These activities must be booked at time of booking and are not included in the quote. For those who wish to relax at the lodge and recuperate after the last day’s activities, then this is of course also an option! Breakfast at the lodge. Hot lunch or packed lunch from the lodge depending on flight departure time (earliest flight should leave at 2pm). Drive back to Kigali and transfer to the airport for your flight home.